Ever since I tasted those lemon poppy seeds slices at Starbucks, I thought about making some at home but it didn’t really work out. I mean I really like them but I figured they look too much like a bread, and though it is nice to have one in the morning, they kind of look boring on a plate when you have guests… so I turn them into muffins. Well I didn’t have their recipe, but mine ended up awesome nonetheless :P. Time for you to give them a shot. Start with the bowl of your mixer, add the butter and sugar and mix everything until light and fluffy. Add the egg and the cream cheese and continue mixing until is well incorporated. You are getting closer by the minute… add the milk, lemon juice and lemon zest and keep going. In a separate bowl, mix the flour, salt, baking powder and poppy seeds. Now add the flour mix to the wet ingredients and give it a gentle mix. Don’t over do it though ;). And you are almost done. 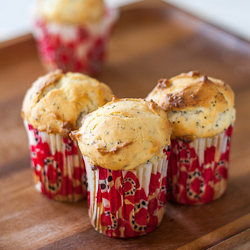 Pour the batter in your muffin tray and if you are not using those cute liners, make sure you butter each hole. Bake for about 30 minutes and be amazed. In the bowl of your mixer add the butter and sugar and mix until light and fluffy. Add the egg and the cream cheese and continue mixing until everything is well incorporated. Add the milk, lemon juice, and lemon zest and continue mixing. In a bowl, mix the flour, salt, baking powder and poppy seeds together. Add the flour mix onto the wet ingredients and mix for a bit. Don't over mix! Use muffins liners for your tray or just butter every hole. Pour the batter in each muffin cup, this should be enough for 12 muffins. Bake for 25 to 30 minutes and enjoy. love how it turned out so cute! like little wild mushrooms! lol yeah and the muffin tray was small compared to your regular size thing. I have the same baking cups and baking tray. I love using these two unique items to pull off a funky look when I make cupcakes for friends and family! I can’t wait to try your recipe as well! Great job! Where did you purchase the baking cups? They’re adorable.